We're Gunna Need a Bigger Boat! Here is a in-progress photo of the harbor master station I am building for the end of my pier. 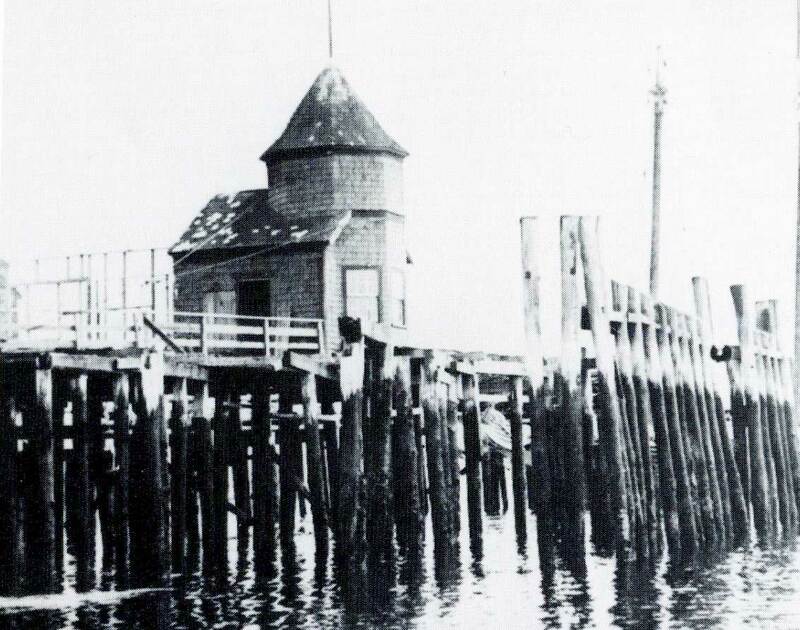 It is based on the Wiscasset, Waterville and Farmington (WW&F) pier station at Wiscasset Maine. The prototype building is covered in shingles as shown in the photos. This will be the configuration for the kit to be offered by Alkem Scale Models. 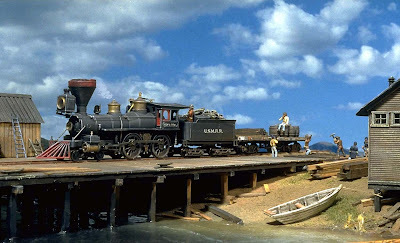 I may do another version for my scene that uses board and batten siding as that seems to be what the USMRR used at Aquia. 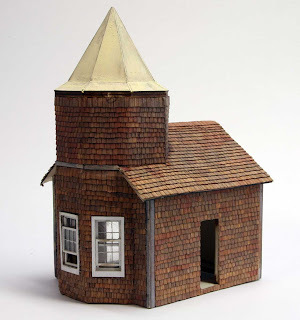 The On2 and On30 modelers that are doing Maine will want the shingled version. The shingles are actual cedar wood with self adhesive film and laser cut to scale size. Even the thickness is scale size though the self adhesive film adds a few thou to the thickness. I will also offer the shingles separately as they work in O and HO scale. In the meantime, I am applying coats of Minwax Polycrylic Clear Gloss to the water surface in Aquia Landing. The instructions say three coats is enough for normal applications, but I am trying to simulate water and three coats is not enough to convey a feeling of depth. I am up to 5 coats right now and it looks like it is holding. Has anyone tried using this product in 10 or so layers to simulate water on a model project? The photos show the nice reflections I am getting with this surface. Once I get sufficient depth, I'll add the piers and docks. The final coat will be acrylic gloss gel to add some wave texture. The reflection at the wall-flat water interface is not realistic. But once I add the piers and ships that discontinuity should be minimized. This gem of a photo popped up on a recent search of the US National Archive. I have not seen this one before. How many other gems are hiding out there? I need to get a higher resolution copy of this photo. The .gif in the NARA website is low resolution. 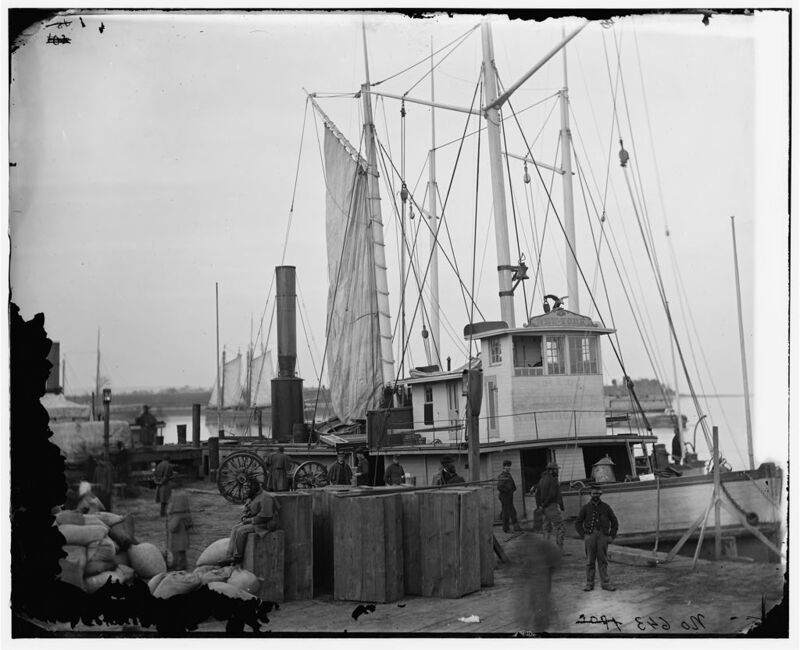 These are views of two photos from the Library of Congress that show ships docked at Aquia landing. The left photo shows members of US IX Corps under command of Maj General Baldy Smith embarking for a trip to Ft Monroe in 1863. The Corps later went back under General Burnside's command in the western theater. The IX Corps is usually associated with Burnside. Note the details of the ship, though the name is not discernible, the paddle wheel housing and walking beam engine is very clear. Modeling a ship loaded with soldiers like this would be a challenge. The second photo shows the SS New York, a medium sized screw tug with faint markings for the Philadelphia and New York Express Steamboat Company on the conning tower. This ship is probably being leased by the US Army Quartemaster Corps for supply service, but I have not been able to dig up much more about it. The ship has a sail rigged on it's mast even though it is docked with a second ship alongside it. Even these simple tugs have interesting rigging that will be fun to model. Note the bent handrails, eagle and numerous other details. I believe the pilot house eagle was a traditional decoration for steam tugs and coastal craft, kind of like a sailing ship's figurehead. 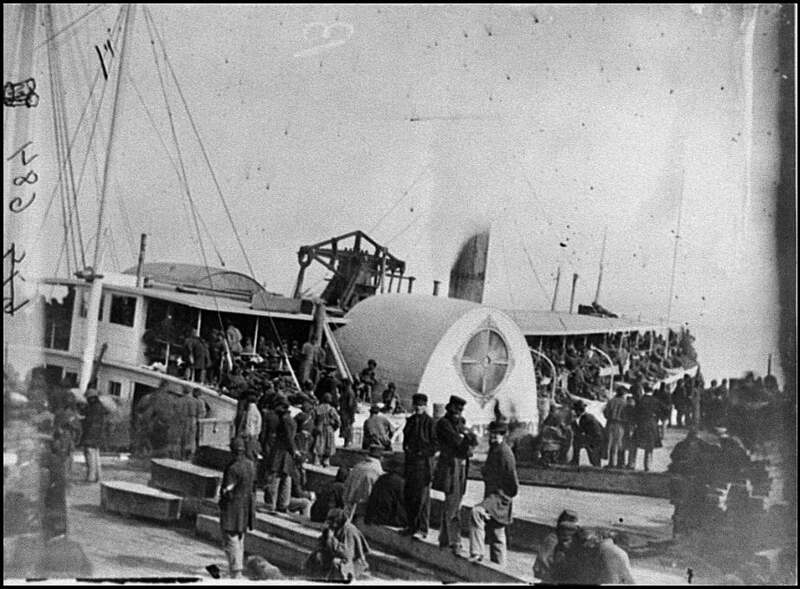 Note the wagons, people, oil lanterns and cargo stacked on the dock. The oil lanterns provide and opportunity to add lighting to the layout. Also note the sailing barge in the background. All-in-all a scene definitely worth modeling. His resolution versions of these images are available at the LoC website if you wish to study them in detail. Here is another possible idea for the harbor area. 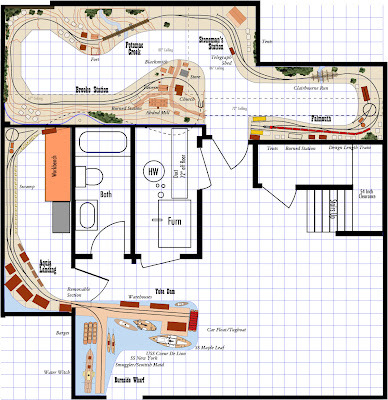 This plan, version 2B, is a redesign of version 2A that doesn't expand into the main basement room. It utilizes a six inch wide pier along the backdrop to represent Burnside Wharf. 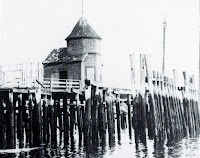 A large paddle wheel steamer would be docked in front of the wharf. It's job is to look cool and hide any hole in the wall to staging (see below). 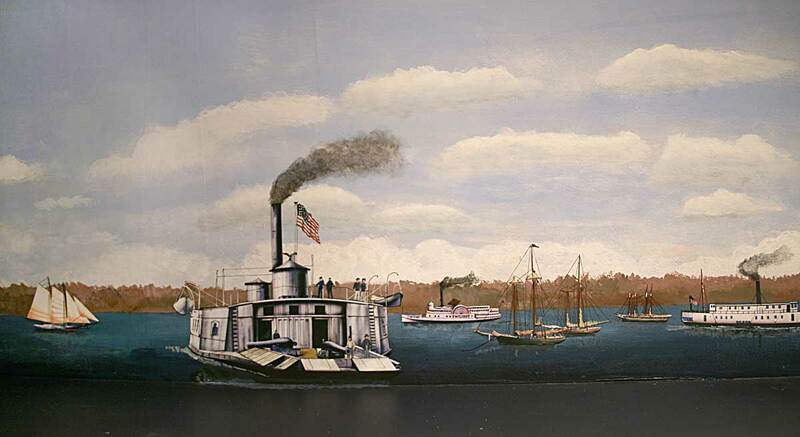 A second large ship would be painted on the backdrop behind the pier. The pier would help hide the water-to-wall transition. 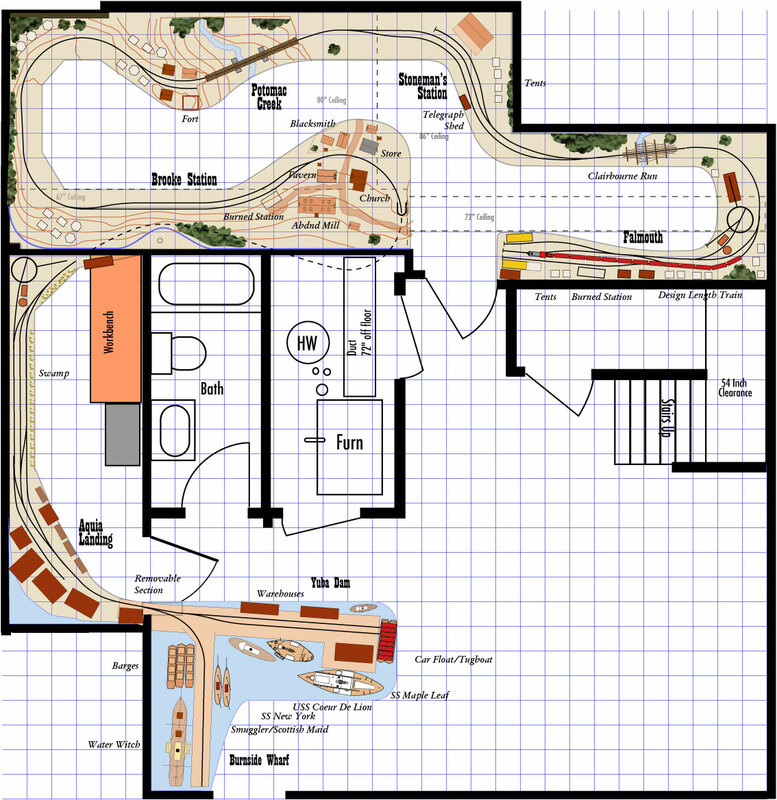 The main draw back of this plan version is that it could be difficult to reach this track to couple up cars, especially cars all the way in the corner. It would be possible to punch a hole in the lower wall and run the Burnside Wharf track into the closet on the other side of the wall. This would allow access to the cars if one would walk around to the closet. This plan has more operational possibilities than 2A, but not as much as the version 3. The larger paddle wheel steamer would help hide the hole in the wall. The steamship Maple Leaf had a two deck superstructure which should be tall enough to do the "hiding" job. I could omit the car float and assume it is on Burnside wharf in staging, since I haven't been able to find out where the float bridge really was. That would lengthen the tracks on the forward pier and make room for other ships. I envision operations in this design to work like this. The pier tracks act as visible staging. The yard switcher in Aquia would retrieve cars from the piers and sort them onto trains to take to the various stations. 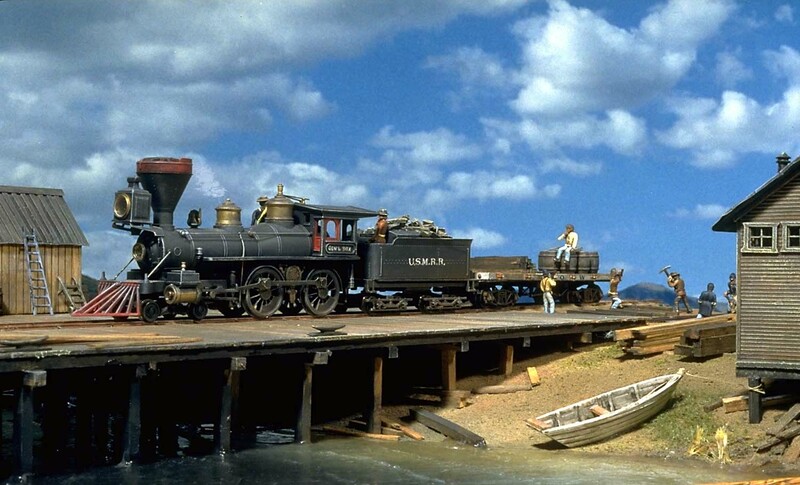 There aren't any real "industry" tracks in Aquia. It might be worth trying to figure out where to fit one or two to make the Aquia switching job more interesting. Version 3 has that. Perhaps a stub siding could be fit into the area to the right of the turntable. 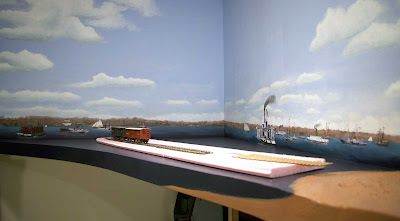 Even without the additional length of staging in the closet, the pier is long enough to hold a full length train. Hmmm.... here is a sketch showing what this design might look like. The track in the back pier is hard to see with the ships and buildings blocking the view. It really is just a not-so visible staging track. On our trip to Montreal we stopped by the National Park Service Saratoga Battlefield Visitor Center. I had never been to that battlefield before. It is a nice park that preserves a good portion of the actual terrain, which is very rough. I was pleasantly surprised to find these two excellent dioramas depicting scenes from the battle. The dioramas are presented as shadow boxes. The viewing window is about 3 feet square, with about 2 feet deep scenes. The figures are hand sculpted using forced perspective, so they are not the same scale. The forest scene has some of the best model trees I've seen. Each leaf is modeled correctly. 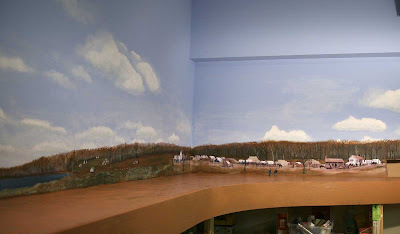 The backdrop paintings are extremely well integrated into the scenes. The lighting used in the diorama works very well for viewing in person, but it made photography difficult. As we depart for a trip to Canada to see the Canadian Grand Prix in Montreal, I thought I post a drawing of a potential expansion of the track plan for your consideration. This plan shows an idea I've been bouncing around for a couple months. The large size of the ships making the current harbor looked cramped is pushing me to it. It also affords more operation at Aquia Landing. It expands the Aquia Landing area by about 60 percent in running distance, but more than doubles the surface area. It allows for more switching in Aquia Landing by having a representation of Burnside Wharf and a Quartermaster Track in the landing area. It also allows for more room for ship models, as some of these are quite big. The expansion area in the basement is a dead zone, a 10 by 10 feet space that is essentially a connecting room for the workshop, bathroom, utility closet and my office (not shown - the opening in the wall by Burnside Wharf leads to my home office.). I use this area as a studio for photos and other things, but mostly is a large hall like area. This plan leaves ample aisles around the harbor scene. The bench work would be extremely simple as the expansion is just a flat table. Thanks to a tip from a person on a ship modeling site, I found a web site with free paper models for several of the ships I was planning for the layout. These plans should be sufficient to allow me to build waterline models of the Couer de Lion, Maple Leaf and the tugs. I have other plans for Water Witch or Harriet Lane, a large paddle wheel, sailing ships. One of those would be docked at deep water Burnside Wharf. There is enough work here to keep a person busy for many months just building ships. Something to think and comment about as we are gone for a couple days. 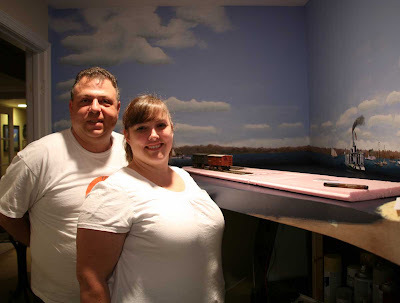 About 11 years ago I built a diorama depicting the USMRR railroad car ferry for the Lyceum, Alexandria's City Museum. This weekend I had a chance to stop by the Lyceum to check on the model. It seems to be holding up quite well. The glass case is doing a great job of protecting it. 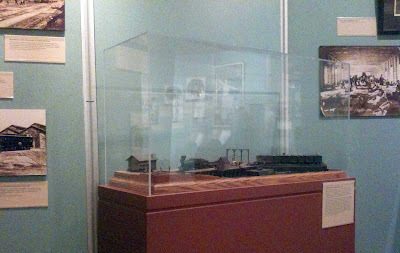 If you are visiting Alexandria and are interested in railroad history, the Lyceum has a nice display and is worth a stop. 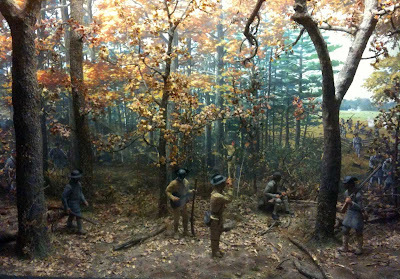 The photo shows the diorama in its setting at the museum. The shots were hand held with available light, so the images are quite grainy. For more images and info about the model see this link. Earlier in the day Alicia and I stopped by the Smithsonian Museum of American History. The last time I was there the nautical history display was closed, but it was open today. The display was renovated and they have a nice selection of ship models, artifacts, etc. on display, though I think they cut back on the number of the ship models compared to the display that was there several years ago. Alicia found the cut-away model of the factory fishing ship very interesting. One thing that really struck me was how big ships in 1/4 inch scale are. I will have to be real careful in selecting ship models for my harbor scene. 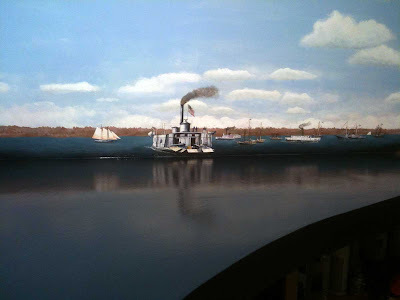 In the Civil War section of the "Price of Freedom" display, they a 1/48th scale diorama of the Battle of Hampton Roads between the USS Monitor and the CSS Virginia. The ironclad USS Monitor, at 172 feet is surprisingly long. The Virginia is 275 feet long so the model is about 5.7 feet in 1/48th scale! The models of these two ironclads were pretty basic, but in the nautical history display on the museum's lower level they had some very detailed models including one of the city class ironclads, "Carondelet. It's about 18 inches wide in 1/48 scale. There were several models of side wheel paddle steamers on display but none that would be a suitable prototype for my layout. 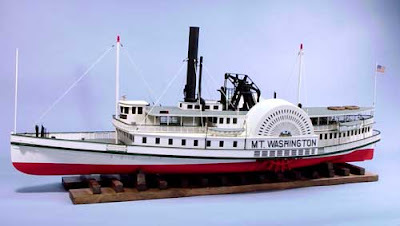 On Saturday night I discovered a 1/48th scale model of the Mt Washington side wheel paddle steamer available from Dumas Models. The kit is an impressive model designed for Radio Control but is detailed enough it could be used for display too. Unfortunately at 44 inches long, it is probably too big for my harbor scene, but this type of ship is perfect for Aquia Harbor. For example see the picture below. The photos show the brake parts that are part of the new etching. The brakes work just about like the real ones, though you don't have to make the brakes operate if you don't want to. There are also other freight car detail parts on the etch. I intend to offer this etch with each freight car model I produce. I will also make the etch available separately. These trucks are designed for Intermountain O Scale wheel sets. I will also produce a set for P48 wheel sets. The linkage parts are etched. The links use etched clevises soldered to 0.032 inch rod. 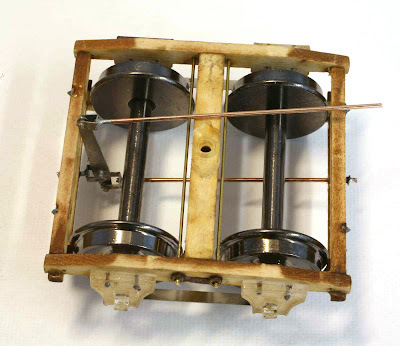 The main link is a single etching. The parts in effect create a four bar linkage, a favorite of mechanical engineers. The hanger straps act as a spring to retract the brake beams away from the wheels. The kit will include both stainless steel or laser cut resin board for different forces of retraction. In a prototype truck, the hangers are just for safety and the weight of the beam is sufficient to retract it. This is a key departure of the model design from the prototype, but essentially transparent to the user. When installed in a car they work as follows. The brake wheel turns and winds a small section of chain around the brake wheel shaft. The chain is secured to the upper link. (There is a clevis for that link included in the etch but is not shown in the photo.) The chain pulls the upper link toward the rear of the car. The displacement of the upper link acts on the main vertical link. It rotates about the center link while also displacing to the center of the truck, thus pulling the brake beam towards the wheels. As the vertical link pivots it pulls the lower link to the center of the car, pulling the rear brake beam into the wheels. 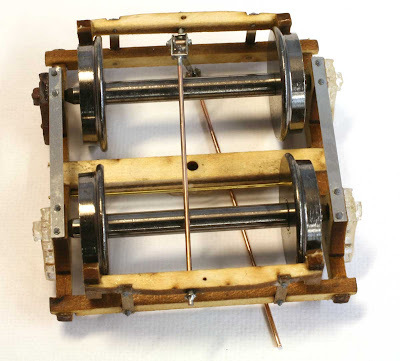 Thus the two brake beams pull together. The strap rails retract the brakes when the chain is slackened. The links are articulated so that as the car negotiates curves the brake linkage doesn't snag. All in all it's pretty cool. See this post for a video of the brakes in action. The switch stands are also done and will be available for sale soon. I made a big push to finish the backdrop at Aquia Landing this Memorial Day. It was appropriate that I was painting and adding Old Glory to the ships that are docked in my version of Aquia Landing. In the Civil War the flag was a powerful emblem. Many a soldier lost his life to preserve his unit's colors, whether the National or Regimental Flag. For ships, the flag (or ensign for you squids) was an even more important device as it was the only way they could identify themselves as friend or foe at a distance. Many Confederate blockade runners and raiders escaped Union attention by flying deviously a color other than the stars and bars when leaving foreign ports. The pink plank is a mock up of the future pier at Aquia Landing. It will be about 6.5 feet long with a car float at the left end. Since the car float is a transverse loading type, moving it during an operation session will not be simple. So the far end of the pier will act as the car float staging tracks. We won't actually drive the cars onto the ferry during an op session. The car float on the backdrop is a piece of Brian's artwork that I modified. Most of the rest of the ships are cut-outs using Brian's art, scans of ships from books, colorized versions of photos from the actual Aquia Landing, or photos of current ships like the Pride of Baltimore and Armistad replicas. The last few I painted in place as they were quite small. I ended up with 23 ships, but need to add some barges. The bench work is a set of Ikea Ivar shelves. I understand they no longer carry these shelves in stock. The make good workshop shelves, and pretty good model railroad bench work too. This is the south end of Aquia Landing. The tracks will go through the wall at the far right of the photo. Recall that landing is at the end of a swampy, low lying promontory that juts into the Potomac River. The river is about 3 miles wide at this point. Where the spit of land reaches the mainland is a sharp ridge. In my layout the viewer is standing on the north side of the spit looking to the southeast. I tried to capture this topography in the backdrop painting. At the far south end I used Brian Kammerer's camp artwork to provide some detail. I enlarged it and placed it in front of a wooded ridge. I painted some foreground trees to hide the seams, but the overall effect is much different than in the other locations on the layout where I used Brian's art. I also painted a small camp scene in the distance using a LoC ACW photo as guidance. The last thing I did was give the scenery a base coat of paint. The paint is still wet in these photos. Once the paint is dry, all is ready to start laying some track! Here are some close ups of the ships on the backdrop. We also had the pleasure of two visitors today, Norman and Daylene Wolf. Daylene is a first time visitor, while Norm is getting to be a regular.